And so another school year has come to a close. The last four weeks have been very busy: marking, exams, report cards. After months of thoughtful engagement with my students and their blogs, I spent the last few days of this school year calculating medians and grade equivalents that my students achieved on a standardized test. I also had to reduce the work of every student - months of network- and knowledge-building - to one final grade. I had to translate all that engagement into a number. Many of my students were also very busy calculating their averages and memorizing their review sheets for a variety of subjects. Reflection was replaced by the thoughts of "doing well" on exams or achieving that much-coveted average of 80% or higher. Who has time for reflection when we're busy perpetuating the institutionalized commodity of learning? Before the end of the year and the madness that comes with the final exams, in an effort to counteract this focus on grades, I encouraged my students to reflect on their independent research projects that they have been documenting on their blogs. Many of them took up the challenge and gave me an interesting glimpse into their learning. On Monday, June 4, 2007, Chloe wrote her final entry in which she reflected on her research on child soldiers. 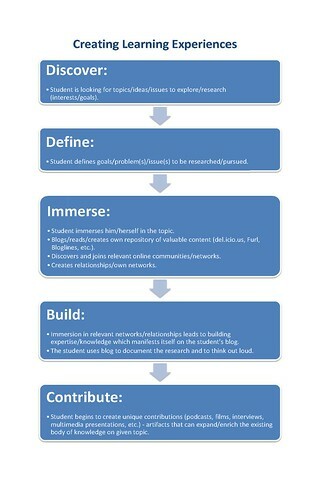 This is what happens when we compartmentalize learning into neat chunks. There's nothing that's stopping Chloe from continuing her research. I can make sure that she has access to her blog for as long as she needs to. She can also transfer her entries to a Blogger blog, for example, and continue her efforts there. Unfortunately, the one thing that school taught her very well is that learning ends in June, that it is organized into neat units, and that weeks and months of learning can be reduced to a single test or exam. On Sunday, June 3, 2007, Michael wrote a reflection on his research on genocide and, specifically, the situation in Darfur. What have we learned now about genocide now? After all the things that have happened with genocide to people over the years all the death, people always forget the results of genocide. We have learned nothing. If we had this would not have happened in Darfur. This genocide has been started by: president Bashir, vice-president Taha, and security chief Gosh. These men are from the Sudanese government. They are supporting the janjaweed militia while lying about doing so. It is a massacre/genocide on all of the non-Baggra population. The Sudanese government is making sure no one finds out anymore and is trying to kill all witnesses of these things. Now this is agreed upon by everyone that this is a genocide. When the United Nations try to help the Sudanese government attacks them. What has begun at just Darfur is now beginning to spread all the way to Chad and Central Africa. This is a current situation that has already had a major effect on people in that area, already 450 000 are dead from violence and disease. This genocide is currently not very big and has not killed huge amount of people yet, but it is growing. Soon it will grow larger if it is not stopped soon. We must stand up and stop the wrongs happening in Sudan. Both of the above entries show, in my opinion, that these two students engaged as learners. They researched topics that they were passionate about and they have both become experts. They certainly know more about their respective topics than I do. They have created on their blogs a cognitive trail of their efforts. They have created learning objects that I, their teacher, can now learn from and perhaps even use next year when discussing these topics in my class with another group of students. Of course, I knew about child soldiers and the situation in Darfur - not to mention some of the other topics that my children explored this past year - before the research projects started. But through these blogs, through their research, I have learned more. I have also become engaged not as a teacher who needs to know what the students are doing in order to assess and evaluate, but as a human being whose thirst for knowledge was satiated by a group of fourteen-year-olds who set a goal for themselves - a goal of exploring issues they found relevant and interesting. The fact that their goals were their own made a big difference. Their work also made me realize that I can measure their success not only by how much they have learned individually but also by how much they have learned from each other and by how much they have taught me. This past year, through the research that they have been documenting on their blogs, my students expanded my understanding of all of the above issues. They have found many links that I eagerly added to my delicious account. They have expressed views that I had not come across before. They started multiple conversations and expressed themselves in what Darren Kuropatwa calls "galleries of thought." They engaged as researchers interested in expanding their knowledge. Too bad June had to put an end to that. My Twitter page shows that I've been spending a lot of time commenting on student work in our grade eight blogosphere. Perhaps "commenting" is not the best word to describe what I'm doing. I'm trying to engage students in conversations about the topics they're researching. This is not just about giving feedback. That would only reinforce in my students the notion that their blog entries are final pronouncements on a given topic, that each entry is conclusive and definitive, written to be commented upon and evaluated by the teacher. I want them to understand that every entry that they post is only one of many steps in their journey as researchers. In other words, I want them to see their blogs and their entries as organic entities, as attempts to engage with ideas, as evidence of growth and development. It's about maintaining conversations, not ending them by saying "Well done!" or "Good job!" So, while I do post comments, I want them to show that I see the students as independent researchers, as individuals who need to know that their work has value not because it will generate a grade but because it keeps me glued to my laptop screen at 10:30pm on a Tuesday night. I read because I'm learning, not because I have a gradebook to fill. Needless to say, in order to have these conversations, I needed to abandon my teacherly voice in favour of a more conversational, expressive, and readerly voice of a participant. I think I succeed most of the time but I'm still at a point where I have to carefully analyze my responses to student work before I press that "post comment" button. They still tend to be evaluative, of the "teacher knows best" variety. They still tend to end student engagement. "This deserves a B+," they seem to say, "now let's move on to another assignment." Dawn, I am really looking forward to learning more about child soldiers from your research. I've always been interested in this topic but never really had the time or the opportunity to do serious research. The video is excellent - I'm glad that we got YouTube unblocked and that it is possible to post videos on this blog. What a great way to start your project - with a poem! I think the repetition of this line - "Lies and hatred obscure all truth" - is very effective. This is what the whole problem of child soldiers really boils down to - brainwashing. I'll be visiting your blog regularly - inspiring stuff! In my comment to your previous entry, I wrote that I was really looking forward to learning more about child soldiers from your research. I feel that I am learning. You are very good at combining facts and statistics with your own personal thoughts. Your writing is personal and informative, thoughtful and engaging. I find this topic very sad but I am glad that you chose to research this issue. Forcing children to fight in a war and to kill is a reprehensible act. It is wrong on so many levels. Is anything being done to stop it? Have there been any attempts, either in Sierra Leone or other African countries and Western nations, to introduce laws to protect children and punish those who recruit and use them as soldiers? Perhaps the region where this is happening is too unstable to do anything about it. Are any other countries doing anything to stop this? Also, you should probably take a look at this: Declaration of the Rights of the Child It might be helpful to you in your research. This probably does not read like anything out of the ordinary but, to me, it represents a long period of learning to engage with students as a learner and a participant and not a teacher who has read it all and knows everything the students can possibly come up with. I've had to learn this and it is still a challenge. Are there any gaps in my knowledge? Assigning a grade is not going to help them in this process, primarily because grades are final and tend to stop progress. Once we attach them to student work, they indicate what has been accomplished, not what can still be done. They do not measure potential. So, instead of assigning grades, even progress grades, I want to experiment with my own take on instructional conversations (and here). I've devised a Personal Progress Chart (work in progress) that I'll be testing over the next few weeks. I want my students to realize that learning is not about making your work conform to some standard imposed by the teacher. Learning is about creating your own standards and adjusting them based on your goals. Learning is about setting your own goals and monitoring your own progress. It is about having conversations with yourself and others. So, instead of imposing, I want to ask: What do you want to accomplish? What do you think is good? What would make you feel proud? I want to promote a process of questioning and I want to do it through dialogue. If I give my students a list of my own criteria or a rubric then I'm essentially asking them to listen and conform. They may have the freedom to do their own research but if all their work is expected to conform to a rubric imposed by the teacher then they are still just trying to reach some goal that may have very little to do with who they are and what they're interested in. So, instead of giving my students a list of criteria, I want to talk with them individually and get them to develop their own. 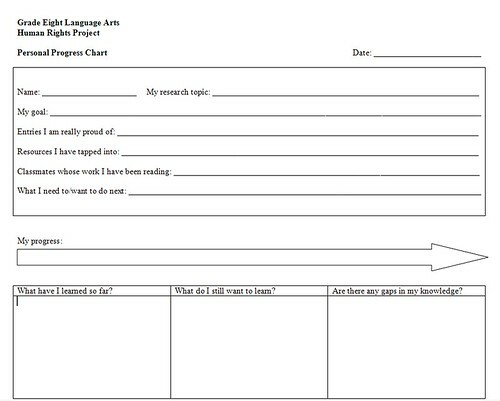 I want them to use the progress chart to think about where they are, where they see themselves going, and how they think they can get there. I want them to use this chart to ask themselves questions about their own work and their own work habits. I want to use the chart as an opportunity to talk about their work, one-on-one. I'm tired of having conversations about grades. I want to start talking about ideas that they care about. I'm hoping that this guide will help. This is, of course, work in progress. Any thoughts and suggestions would be greatly appreciated.